Ajit Harisinghani is a speech therapist by profession. 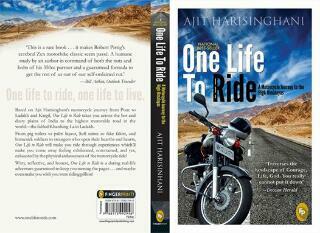 ‘One Life To Ride’ chronicles his motorcycle ride in India. He has travelled overland across the USA, around the world on the hippie-train in the late 70s, and on a motorcycle from Pune to Ladakh (North-most), Thimpu, Bhutan (North-East) and Kanyakumari – the southern most tip of India, with numerous rides to Goa. Learn more about him here and here. NAW- Tell us about your book, One Life To Ride. What is it about? How did you get the idea for it? One Life to Ride looks at India from the seat of a motorcycle. The diversity of terrain, its people, their beliefs and traditions form part of the narration which a voice periodically interrupts with flashbacks from along a 54-year life. Around the time I returned from the ride, the Department of English at Pune’s University was offering a course in creative writing which I was fortunate enough to attend. The company of budding writers and guidance from Dr. Raj Rao inspired me to attempt and write a whole book. NAW- Were you apprehensive about going on a bike journey at first? Did family and friends dissuade you or encourage you in your quest? I was never apprehensive when I started off. The cocky side of me said ‘Just Do It’. The ride would be a kind of diagnostic test of the body’s overall performance and no less – a test of the mind faced with the myriad situations that invariably embed a 4300 kms. road trip through an unpredictable country. The going got tough on the 500 mile Manali – Leh road with its 5 icy-mountain passes (12000 to 17000 ft. high) and respect began to replace cocky-bravado. The Himalayas do that to you. No one tried to dissuade me and it wouldn’t have worked anyway. In fact, many of my friends encouraged me. Perhaps seeing me as a vicarious fulfiller of their own dreams of riding free on an open road with the breeze singing. NAW- The best part about ‘One Life To Ride’ is there is no hidden anger or outburst, it’s just a simple travelogue written honestly and sprinkled with humour. I think it works very well for the book? Did you take elaborate notes during the journey because the descriptions are vivid and stunning? Frankly, at the end of each day’s ride, all I cared about was cleaning, feeding and resting the body; no energy for writing notes. But I had surprisingly little difficulty in re-living (and writing about) the journey – I guess it had become etched in memory. It was a ride one can never really come back from. About its absence of angry outbursts, I wrote the book with the same attitude that I adopt when on the long road – that of a benevolent observer rather than a judge. There are as many worlds as there are people and everyone lives the best they can. How difficult some lives are and how resilient the people. On a bike you are constantly entering and exiting varied stage-sets with different actors playing out their different stories in real time. I tried to recreate some of their stories in One Life to Ride. Anger had no place in my narrative. Isn’t there enough of it already? NAW- Usually people like going for excursions in groups or with friends to prevent boredom and to have someone to fall back on. Did you not feel the need for a companion while on your trip? Riding with a group has its advantages of course but can turn the journey into a picnic. Riding solo gave the ride a completely different flavour. For one, you are not accountable to anyone else and can tailor the ride to suit your own whim and fancy. Stop wherever you want to and for as long. For another, one might be riding solo but one is never alone on the roads of our teeming country. Helpful people appear when help is needed and sometimes even when not! About needing company, in some of the remote locations where I felt I was the only living soul on earth, it would have been nice to have an apsara or two to talk to but other than such transitory moments, I rather enjoyed being on my own for most of the ride. It allowed me to meet myself. NAW- Given that you have a day job that isn’t remotely related to biking or anything adventurous, how did you challenge yourself for going on a bike trip? As a speech therapist, I am often counselling youngsters on how they can best handle the crises of self-confidence that speech problems frequently cause. Putting my own self in the way of possible crises and seeing how (or if) I am myself able to stay un-flustered in the face of unexpected problems is one of my motivations for bike trips. Anything can happen on an Indian road and usually does. ‘Can I handle it?’ is my challenge. NAW- How much planning went into the journey? Did you also learn about basic bike maintenance to prepare for the trip? Yes, I took a quick refresher course in bike-repair from my mechanic and planned for every conceivable contingency like repairing punctures, replacing cables, etc. Spent a month getting in better physical shape with a daily 12 km. bicycle ride and an hour in the gym. Had to pack in tools and spares and clothing for high altitude. Lots of details to take care of. NAW- Have you always been a bike enthusiast? Which is your favourite bike and why? My first bike (at age 20) was a 175 cc Rajdoot. Then over the next 40 years – two 250 cc Yezdis followed by four 350 cc Royal Enfields and now a 500 cc Royal Enfield (Desert Storm). So yes, I’ve been a biker for the last 45 years! Favourite is my current bike – a 500 cc Desert Storm by Royal Enfield. So many favourites. Somerset Maughm, A.J. Cronin, P.G. Wodehouse, Salman Rushdie, Nevile Shute, Harold Robbins, Henry Miller, Wilbur Smith, George Orwell Edgar Allen Poe, Pu La Deshpande and others. My next solo ride took me from Pune to Thimpu, Bhutan and became the subject of my second book ‘The Living Road’ which is being released by Westland Books at Crossword Pune this week. 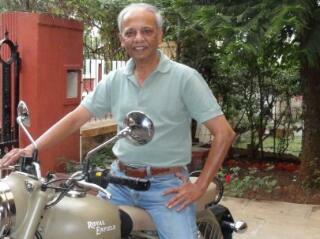 My third long ride (at age 60) was Pune to Jaisalmer and am hoping it will come out as my third book.